Chico, CA—February 12, 2014—For the first time, Sierra Nevada Brewing Co. is aggregating its whole-cone hop prowess into one box, the 4-Way IPA variety 12-pack. Shipping to distributors beginning next week, the 4-Way IPA variety pack features two brand new India Pale Ales, as well as a year-round powerhouse and an updated rendition of a Beer Camp creation. While different in color and character, the 4-Way IPAs unite through intense hop aromas and flavors that underscore Sierra Nevada’s passionate and progressive take on whole-cone hops. Torpedo® Extra IPA is Sierra Nevada’s year-round IPA and uses the brewery’s unique “Hop Torpedo” method of dry hopping to showcase complex citrus, pine and herbal flavor and aromas. 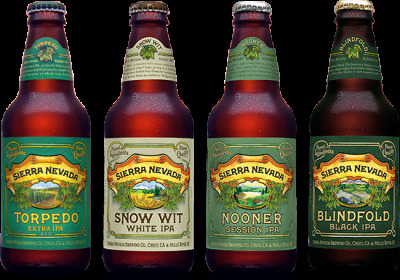 As distributors send 4-Way to retailers, craft drinkers can track down the variety pack using Sierra Nevada’s Beer Locator. And although the recipes are still being refined, Sierra Nevada is developing variety 12-packs for both the fall and holiday seasons.